I'm having a big creative stream of conscious day. One thought lead to another and these delicious hand pies were born. I can’t stay and chat for long though, I have several other ideas I want to get started on before Halloween! You’re going to have about two cups of leftover filling. Make more pies if you wish, bake it into a tart, use it as a dip for cookies, or spread it on buttered toast. I’m going to try it on a pizza with brie, walnuts, dates, and honey this evening. I’ll write that down too if it goes well. The pumpkin stencil cookie cutter comes in a holiday set made by Progressive. 2. In a food processor puree the dates and granulated sugar together until mainly smooth. 3. Add the dark brown sugar, salt, cream cheese, pumpkin pie spice, ginger, and vanilla extract and puree until smooth. Scrap down the sides as needed. Set aside. 4. Gently roll out the pie dough just until smooth between two pieces of wax paper. Make 7 cuts with the pumpkin cutter outline very close together going around the pie dough in a circle, and then an 8th cut right in the middle. Take the stencil part of the cutter, and press faces into 4 pumpkins. Repeat with second dough. 6. Press the faces gently on top of the puree and seal the edges with your fingers. Brush lightly with egg wash and sprinkle with a little raw sugar. 7. Bake for 15 minutes on the middle rack. Serve warm or cold. How perfect for this time of year!! Excellent, excellent. You're on a roll:) So cute..great idea! those are just too darned cute!! 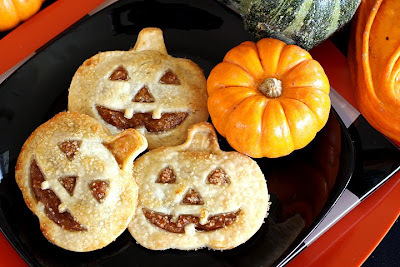 Great recipe and so adorable to boot! I love the filling - it's like fig newton x 1000000000! Love dates! So adorable - I love them!!! Ohhhh! They look sooooo CUTE! Will have to try these! Oh Laura, you did a fabulous job on these! Absolutely adorable!! Oh, they're so adorable...and that filling..yowza..sounds addicting :D Yum! you are awesome! I can only imagine how hard this was to create. came out perfect. I have actually THOUGHT of doing this, but never have yet...YOURS are ADORABLE! Lol I'm light brown with lots of grey highlights Patricia! Thank-you for the comments everyone! I enjoyed them! These are so much fun and sound really delicious! So cute! Wow these look awesome! SO fun! wow ma sono meravigliose!! complimenti complimenti!! These look so fun and festive! I bet the filling is amazing, and I love the look the raw sugar gives it.